Intraoral camera—This pen-sized, camera-tipped wand, which we insert into your mouth, enables you to see the dental problems that require treatment. The intraoral camera takes photos of the inside of your mouth and transmits the images of your teeth through a computer unit to a large video screen. The images take some of the mystery out of dental treatment, enabling you to see the leakage around fillings and the fractures of teeth. The silver filling prevents the x-ray from showing any decay in its vicinity, and the early decay between the teeth is too narrow to be detected by x-ray. Dr. Maron and his staff have 5-star ratings on Google, Yelp, RateMds, Wellness, Healthgrades, and Angie's List. "He requires strictest adherence to hygiene in his office and of his staff members." Our office has a wheelchair-accessible entrance and bathroom. Obstructive sleep apnea can shorten your lifespan by 8-10 years. Dr. Maron makes appliances to treat sleep apnea. Call today for your free consult. "I have been to other dentists over the past many years, but I think Dr. Maron is absolutely the best. No pain. Modern techniques. Superclean office. Wonderful staff." 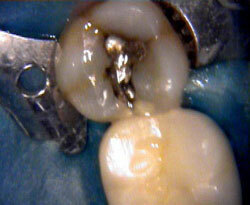 Using a rubber dam or the newer Isolite to keep the teeth dry eliminates the need to use cotton rolls in your mouth. Dr. Maron tries to see emergency dental patients during office hours on the same day the problem occurs. If you have a dental emergency, call early in the day. If your emergency occurs after office hours, call our office for instructions on how to reach Dr. Maron. Each staff member has a radiation badge to ensure the proper levels of radiation are being used. Dr. Maron can straighten your teeth using virtually invisible plastic aligners (Invisalign®). Unlike group dental practices, where you might see a different dentist every year, you see Dr. Maron every time. The waterlines for our drills use a special additive to kill any bacteria in the waterline. "He is constantly updating his equipment and techniques. I currently live in the City and come back to see him because he is the best." Our Solutionreach™ software will send you e-mail and text message reminders 1 week, 1 day, and 2 hours before your appointment. We can also customize the reminders to your preference. If you want e-mail reminders from our office, you may have to set your spam software to allow Solutionreach. Small details matter. Our office has dedicated air lines to prevent moisture contamination of our plastic fillings. Unlike some offices that "take" your insurance and then sell you expensive treatment, such as crowns, our office tries to find the least expensive treatment to fix a problem. Poughkeepsie city and town no longer have fluoride in the water. We prescribe fluoride tablets for your children. 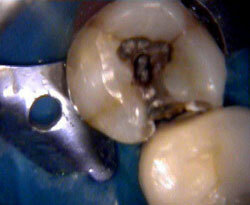 We can detect your cavities sooner by magnifying your digital x-rays on large computer screens. "Dr. Maron and his staff are wonderful. Anyone with children I highly recommend Dr. Maron."